What a wonderfully relaxing (sort of) day. It started with a granola bar, banana, and a little hot coffee. 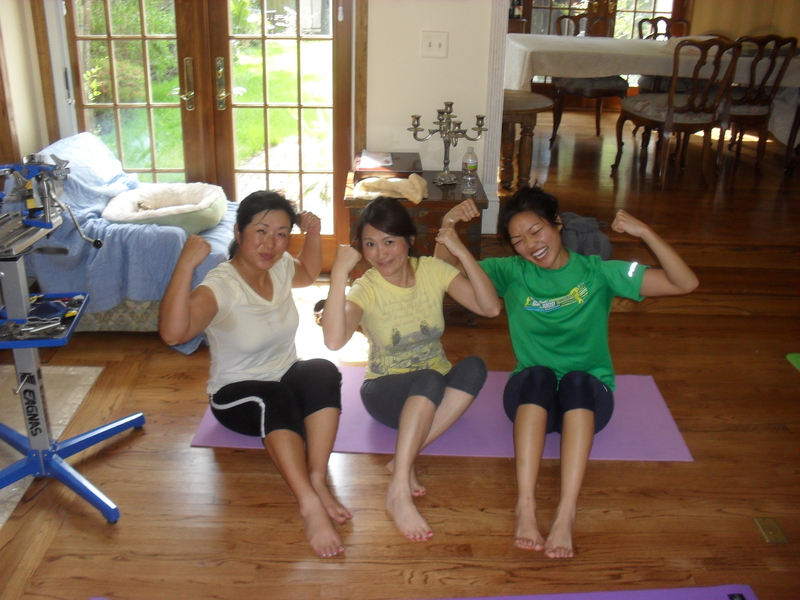 Then I headed over to Jane’s home to lead another workout session for the ladies! We did some exercises using a towel on the wooden floor (great for doing exercises where you slide around), just a bit of yoga to work on stretching out and balancing, some plyo exercises, and finishing with some pushups and planks. In total, it was about one hour, and we had the sweat to prove for the effort! … OH, CRAP! THAT’S ME! On our way to the lunch spot, I just had to thank God for not letting it rain where we were. Do you ever stop to just admire the clouds? Lunch was AWESOMES. I do not want to reveal the place where we went yet (going to take Joe there some time)… but let me give you these two words: SEAFOOD BUFFET. Let me give you two more words with it: TWELVE BUCKS. This place was HUGE and had so many seats and tables (though they were pretty crowded when we went)! This is just part of the seafood area… they also had hot foods and dim sum. The sushi chefs were hard at work in the way back. Round one: many sushi rolls, nigiri (with little rice! I love that they don’t make it all huge and crap), sashimi, salad, muscle, an egg, and asparagus. ^the orangeish blob is sea urchin. Tasted like I was eating a blob of metal and ocean… if that makes sense. I’m not a fan, but I just wanted to give it another try because I know it’s expensive. ROUND 2: More nigiri, rolls, asparagus (I tried to create a wall of it to separate the hot foods from the cold ones… failed), baked salmon, BBQ pork bun, shrimp thingy, and a bunch imitation crab salad (I know it’s cheap, but I love imitation crab, haha). ROUND 3.5: That is a layer of crushed peanut powder stuff on the outside, then a layer of rice cake (dduck), and then sweet black sesame stuff on the inside. The one on the right is a fried sesame ball with sweet red bean inside. ROUND 4: Some soft serve ice cream, one coconut macaroon, a tiny bit of apple pie, and one more of that sesame rice cake ball. We waddled out being so super full! … even after eating like a pack of wild animals, we had a little MORE to eat when we came back to Jane’s house! Speaking of animals, Jane’s neighbor owns some llamas! Jane kindly made us a wonderful cappuccino at her place, and I ate one See’s candy chocolate and about 8 dark chocolate and salt covered almonds. SO GOOD. Dang. Jane’s cat, Waffle, should probably join us for a work out next time. I am going to be headed for SoCal this weekend with Joe’s family, so I actually wanted to work out like crazy today so I can be sore and rest tomorrow. HEAVY LEG DAY!!! WOO HOOO! Used 22.5# dumbbells and did 10 lunges on each side going forward, 10 lunges on each leg to the side, the 10 one each leg to the back. Did that twice through. Used 22.5# dumbbells and did 20 plie squats. Finished with 10 plyo lunges (1 jump switch on each side= one rep). 30 minutes; 4.25 miles? But I’ll round down to 4.0. 11 minutes, and covered 1.20 miles. I walked the last 0.20 mile from 4.8 mph to 4.5 mph as a cooldown (at 3% incline). I just wanted to mention that usually after these workouts, I am tired, but I don’t really hurt anywhere (I mean.. it only burns during the moves). The soreness sets in anywhere from 12 to 24 hours later. I think if you ever feel a super sharp pain after a workout (like you TORE something), then means you probably TORE something. Knees buckling are a given. Mine were wobbles after. No sharp pains, though. BUT also… I am not a certified trainer. With ANY of these moves, you want to consult someone who knows what they’re doing. I had some free sessions with a trainer several years ago who taught me the proper form for all moves and how to use the weights/machines (and she was certified and everything). So if you’re a beginner, don’t just hit up the heavy weight section and try to wing it. Injury= NOT COO’. Do you ever work out really hard so you can eat a hearty meal? Do you have super good self control at a buffet (to stop when you’re comfortably full)? OMG! I ended up being super duper sore the next day, too! I really liked the floor-cleaning moves, hehe. We’ll certainly do more of those. It works the whole body!